By default, hardware acceleration feature is disabled in Google Chrome browser. You can easily enable this feature in Google Chrome browser on your PC. This (still experimental) feature promises better performance while loading webpages using using Graphics Processor Unit (GPU) hardware on the computer. 1. Open Google Chrome browser. Make sure you have latest Chrome browser (version 10 or above). You can easily update Chrome browser to latest version: just click wrench icon at top right and then click ‘About Google Chrome’ option. 2 Type about:flags in the address bar and press the Enter key. Make sure there is no space between two words. A webpage will load listing experimental features of Google Chrome browser which can be selectively enabled by any user for usage. 3. Scroll down and check for 2 options “GPU Accelerated Compositing” and “GPU Accelerated Canvas 2D”. Click enable button next to them. 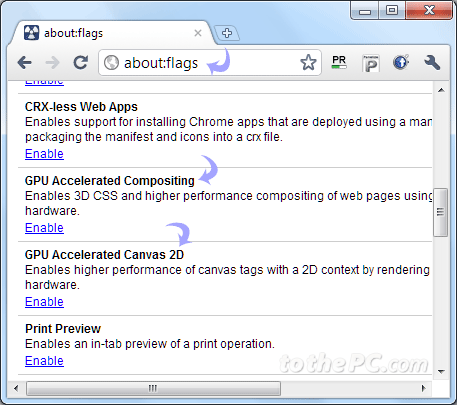 This will enable hardware acceleration in Google Chrome browser. If you have good graphic card processor on the computer, you should see quicker and better rendering of webpages in Google Chrome browser. If you use Internet Explorer 9 as default browser, you can also enable or disable hardware acceleration in IE 9 web browser. Chrome 11 is still a beta in development. Many features may not work until it is officially released by Google Inc.
Google Chrome 11 is installed on mine but i don’t have the “GPU Accelerated Compositing” displayed anywhere.